Don\’t you love it when a single table makes things so clear that there is no room for doubt? Notice where the jobs are being created…………and where they are not? 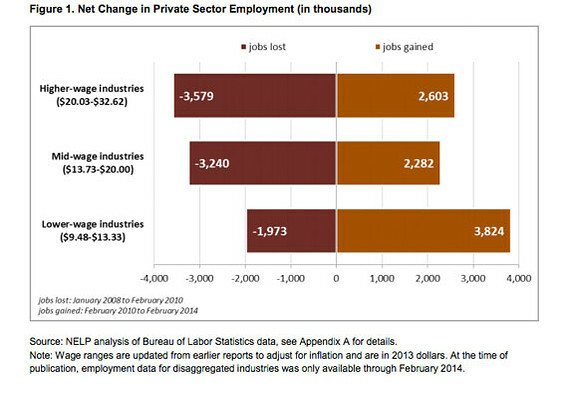 Lower-wage	industries	constituted 22 percent of recession losses, but 44 percent of	recovery growth. Mid-wage	industries	constituted 37 percent of recession losses, but only 26 percent of	recovery growth. Higher-wage	industries	constituted 41 percent of recession losses, and 30 percent of	recovery growth. Would you say this is something to keep in mind when Obama & Co. brag about what great job-creators they are? Now grow old waiting for tonight\’s network news shows to feature it….or talk about it at all.